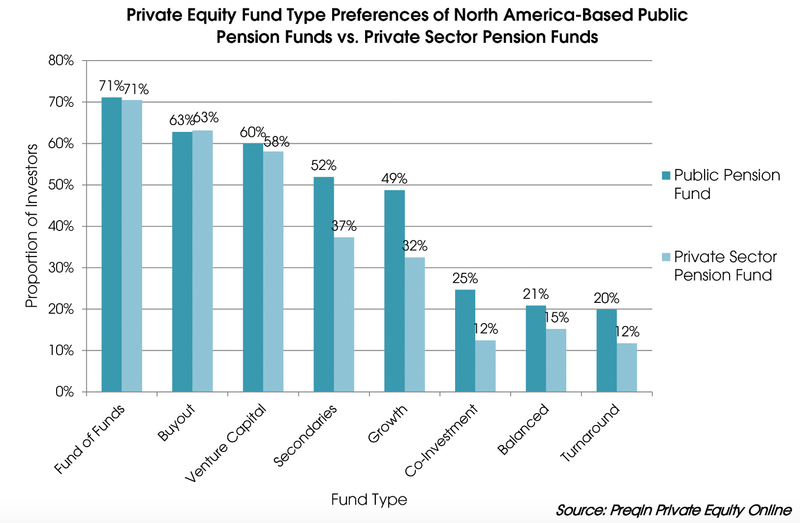 More than two-thirds of North American public and private sector pensions choose funds-of-funds for private equity exposures, Preqin has found. Funds-of-funds are North American pension funds’ favorite vehicle for private equity investments, according to Preqin data. Both public and corporate pensions preferred the strategy, chosen by 71% of each fund type. Funds-of-funds had among the lowest median internal rate of return of private equity fund types for every vintage year from 2000 to 2013, according to Preqin data released in March. However, they were also the least volatile across the same vintage years due to their inherent diversification. On average, public funds targeted an 8.3% allocation to private equity, while private funds aimed for 7.3%. Both were underinvested as of May 2016, with public pensions investing 7% of total assets in private equity and private pensions allocating 6%. These North American pensions also favored buyout funds, preferred by 63% of public and private pensions, and venture capital funds, picked by 60% of public pensions and 58% of corporate pensions. Internal rates of return have dropped for buyout funds founded in more recent years, according to Preqin, while venture capital funds have enjoyed a steady rise across vintage years. Roughly half of public pensions also liked secondaries and growth funds. Private pensions, however, were less enthusiastic, with about a third expressing favor for each. Co-investments, balanced funds, and turnaround strategies were the least chosen strategies for private equity investment, though each was slightly more preferred by public funds. Both public and corporate pensions overwhelmingly preferred to invest within the domestic private equity market, though European-focused vehicles were also popular.